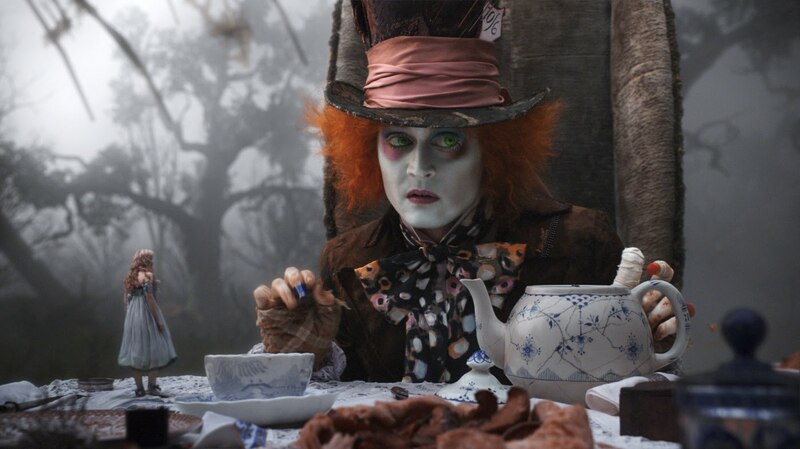 Tim Burton and Alice in Wonderland, a combination that had film fans and Internet bloggers salivating at the prospect. Teamed with Johnny Depp as the Mad Hatter, Helena Bonham Carter (Red Queen), Anne Hathaway (White Queen) and Mia Wasikowski as Alice. Mix together with a very talented voice cast, what could possibly go wrong? Strangely, Burton has decided not to remake Alice but to create a sequel of sorts. The characters and storylines are similar but run almost in parallel, almost as if the rights to the novel were unavailable, obviously not the case. Alice is now all grown up, well 19 to be precise and appears to both remember and forget she was ever in Wonderland before. Perhaps she was so traumatised the first time, only serious therapy would ever recover the memories. A beautiful, fantastical world has been created, augmented by all manner of digital trickery. It all looks fantastic in the usual Burtonesque style. Helena Bonham Carter displays a massive head and tiny body that only her real life partner (Burton) would ever get away with. Clearly enjoying every moment, her role anchors the movie whilst Depp gets to act mad, as he surely must, but little else. All the characters are present and correct, with splendid voice casting, Stephen Fry’s Cheshire Cat perhaps a standout alongside, Blue Caterpillar (Alan Rickman) & Tweedle Dum and Tweedle Dee (Matt Lucas). Paul Whitehouse puts another great turn into his resume, as the March Hare, darting around, cradling his watch and revelling every twitch of his digitally created whiskers. Children will enjoy the casual brutality meeted out to some of the characters, notably poor Bandersnatch and there is plenty of action, which may be diminished in 2D, depending on your viewpoint. Alice is spirited although somewhat lacking in confidence in her abilities, which perhaps is the message of the film, “be all you can be”. Certainly no fault of Mia Wasikowski, who brightens the movie as the film unfolds in every way. Depp is almost unrecognisable in make up, wig and odd contact lenses. Allowing the main attraction to be hidden in such a way is certainly a risk but allows the visuals to take centre stage, which they most certainly do. The scenery is like Avatar on acid, plants with faces and caterpillars who talk, whilst wearing a monocle and smoking from a “Hookah Pipe”. Without the trickery of 3D, the shortcomings in the script and “story” do seem more obvious. Nothing much happens and we are treated to one over the top surreal scene after another, which of course is what the novel, full of childlike wonder, was all about. The effects are excellent, brightly coloured and seamless with characters growing and diminishing in size seemingly at will. The production values of course are top rate and the “Disneyfication” factor many feared, is not noticeable, well certainly not until you leave the cinema clutching your Red Heart Queen Lunchbox and Jabberwocky colouring in set. Does it all make for a great movie though, on this evidence, perhaps good but not great. Good fun and a very pleasant way to spend two hours. We might have expected more from Burton who undoubtedly will do better but this will do just fine for now.